Your dentist in Canton OH understands that dentistry can be a bit confusing! This is why the office of Dr. Hisrich has compiled a list of frequently asked questions for our patients, including information of a variety of topics like at-home dental care, teeth whitening, and other common inquiries. Do you have a question that isn’t listed below? Don’t hesitate to call our office at (330) 493-8400 and we’ll be happy to help! 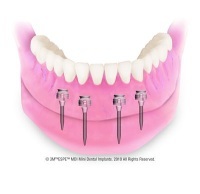 What is the difference between a bridge and partial denture? Do I need a root canal because I have a crown? These are restorations to repair a severely broken tooth by covering all or most of the tooth after removing old fillings, fractured tooth structure, and all decay. The restoration material is made of gold, porcelain, composites, or even stainless steel. Dentists refer to all of these restorations as "crowns". However, patients often refer to the tooth-colored ones as "caps" and the gold or stainless steel ones as "crowns"